The logistics sector plays a fundamental role from procurement via enterprise resource planning, distribution and maintenance to appropriate waste disposal. Logistics have a significant beneficial effect on the flow of utilities, information and goods. These days, it is no longer possible to keep afloat in the modern business world without logistics specialists. Here a critical role is played by perfectly organized processes relating to information, responsibility, manufacturing, quality assurance, packaging, transport, distribution and realization, to name just a few. 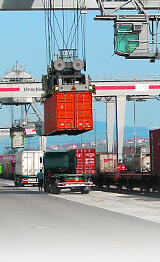 In order to help you gain a rapid overview, we have subdivided the services offered in the logistics sector.